We were both as high as kites above Pittsburgh. Me because my book had just come out, and Susan because she had just found out that not one but two of her quilts had been chosen for the 2010 Quilting Arts Calendar, one of them actually being on the cover! That’s right, those stunning citrus slices are Susan’s. Not only that, she and C&T Publishing were hard at work on Susan’s first book due out in the fall. During the summer, C&T contacted me to ask if I would like to write an blurb about Susan’s book. Would I! They sent me an advance galley copy of Applique Petal Party so I was able to pore over the gorgeous floral designs and the written information. I wrote my blurb and sent it in. Check out the interview with Susan on the C&T blog. Now the book is out! 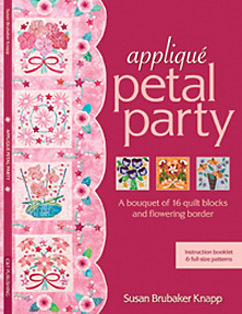 Applique Petal Party is presented in a unique format… a glossy heavyweight sleeve contains an instruction booklet and… get this… 16 full-size patterns! Each block is 13”, so what a convenience. You can make the Petal Party quilt, a smaller wall quilt, or use these designs whenever you need an appliqué block. 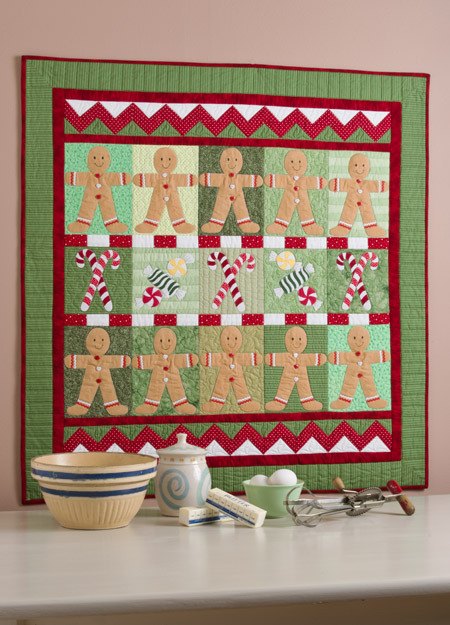 Click here to see the full quilt on the C&T site.. The booklet gives great hand appliqué instructions plus construction information for the Petal Party quilt that goes from cutting to quilting to binding and labeling. The quilt has scalloped borders so here’s your chance to learn how to do those, including the binding part. My blurb? It just flowed from my brain through my fingertips to the keyboard. When I got the book, I saw that my quote had made the back cover! In fact, it’s the only one!!! Wow! Pacific International Quilt Festival was last weekend and as usual it was a colorful, energetic, heavenly concentration of quilts, quilters, and wares under one roof. 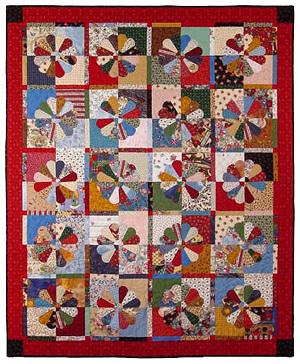 The quilt that reached out and grabbed me this year was Fragrant Memories by Rachel Wetzler of St. Charles, Illinois. I think Rachel succeeded in the smellorama department, don’t you? I wanted to step right into that kitchen and dive into a cinnamon bun. This quilt won the Best of Country ~ United States award in the World Quilt Competition. Thanks, Rachel, for sharing your fragrant memories with us. Thank you so much to everyone who came over from the Bloggers Quilt Festival and left amazing comments about Shopping Bags. I cherish each and every one; you’ve done my heart good. 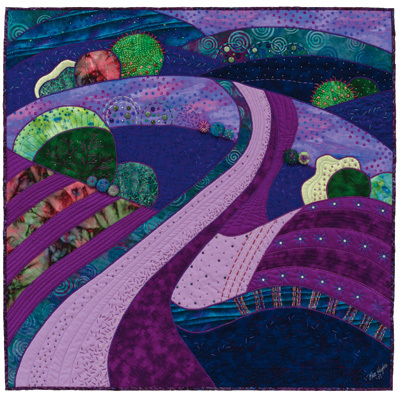 Here’s the quilt that appeared in American Quilter. Funny that they were originally attracted to the pattern from the dark blue quilt, requested an additional lighter sample, and then never used the first one at all! In this quilt, the bags were pieced into the background instead of appliquéd on. Thanks to Martingale & Company / That Patchwork Place I have another fantastic book to tell you about. Most of the patterns include appliqué, because as Cheryl put it, “I love the shapes and the graceful curves you can create, as well as the flexibility the technique provides.” Of course you can use your favorite form of appliqué, but Cheryl gives you full illustrated instructions for the fusible-web machine method, and has even reversed the patterns for you. That’s a real convenience. This one makes me hungry. The book includes a whole section of basic information about fabrics, threads, sewing machines, needles, tools, etc. That’s before you even get to the Quiltmaking Basics: rotary cutting, fusible web appliqué, pre-assembly, bias vines, and even paper piecing. The bag popped into my head a number of years ago whilst tromping the aisles at Pacific International Quilt Festival. It must have been the heavenly combination of quilts, fabric, and shopping! It took awhile for the concept to get from my head to a design. Yes, kids, each bag has set-in seams in two places. That did not deter me. I used freezer-paper templates and sewed carefully, and they came together just fine. It was gobs of fun rummaging through my stash for fabrics to make the fronts, sides, and backs. For the sides, I chose fabrics where I could use both the back and the front, to add to the illusion of a folding pleat. After the bags were all sewn together (by machine), I turned over a quarter of an inch all around the edges and pressed. I chose a swirly background fabric and made my best stab at an artistic arrangement. In fact this may have been my very first quilt to come even close to being an “art quilt.” I just wanted them to hang there in space and overlap and float in and out from each other. Once the bags were arranged, I basted them down and stitched the turned edges like appliqué, changing threads to match or blend with each fabric. I went to the craft store to get something for the handles. I made my choice and as I was standing in line I saw the manager. Susan!” I yelled. “Whaddya call this stuff?” “That’s rat-tail cord,” she replied. Who knew. I couched the cord into place using one of those curve-bar thingies for placement. Get this… I totally forgot to leave enough background fabric at the top for the handles. I quickly figured out that the topmost handles were going to stick up off the quilt. A happy accident… I get comments on how creative and clever this is. 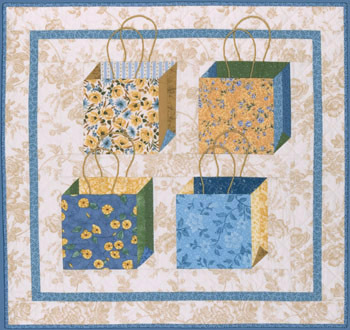 Along with a different version of the quilt, the Shopping Bag block pattern was published the Fall 2005 issue of American Quilter magazine. Hope you like Dana’s choice! Visit Park City Girl every day through October 16 and get a ringside seat for other bloggers’ quilt picks. … And we’re back. 2.8.4 at last! What a weight off my mind. Of course a lot of the content in my sidebars evaporated and I spent the morning rebuilding them, but hey, at least I’m up and running again with the most important stuff. And now for today’s post. DH Dana and I are both writers. However, there’s quite a difference between the type of comments we each might make upon entering each others’ offices. Here’s what he might say after wandering into my studio. It works out quite well actually, at least for the last 20 years :). 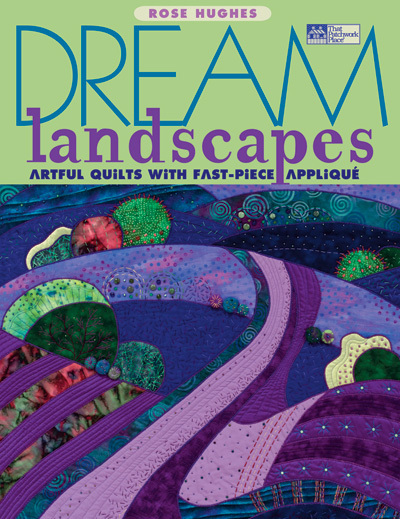 I’ve been looking forward to delving into this month’s book, Dream Landscapes: Artful Quilts with Fast-Piece Appliqué by Rose Hughes. 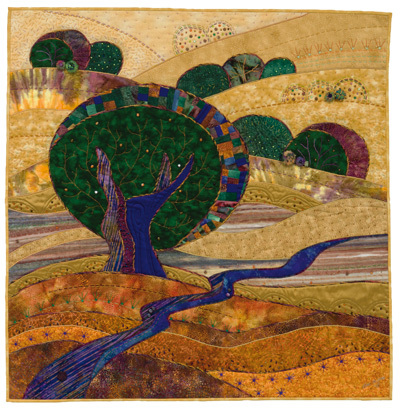 Landscapes, art quilts…. totally out of my arena and it’s always interesting to learn new things to throw into one’s appliqué bag of tricks. Once I read through the process, it was one of those V8 Moments. Wow, it really makes a lot of sense! Rose’s method employs tracing paper, freezer paper templates, and machine-sewing the pieces together from the front… simple and direct. She takes us through a small teaching project first and then provides several patterns and a beautiful gallery of her own and her students’ work for inspiration. Look at those beautiful flowing curves! Circles sewn without clipping or pinning! 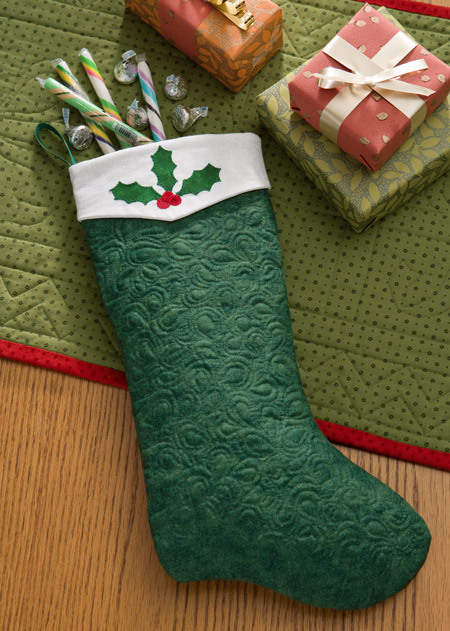 The book includes a quick tutorial on color, full and detailed step-by-step instructions for Fast-Piece Appliqué, and a lot of information on yarn, which is couched over the top of the stitching lines to delineate the shapes and cover raw edges. The couching also provides the initial quilting. 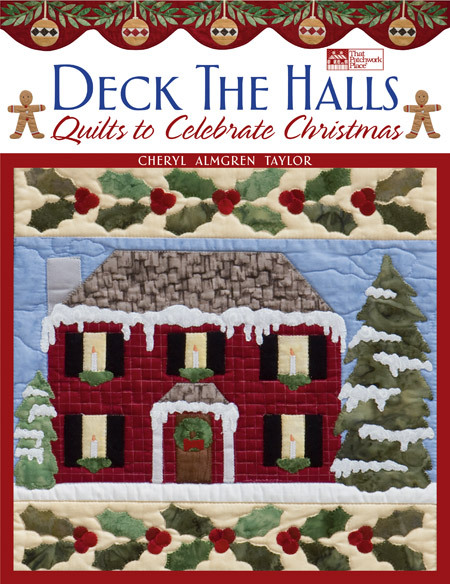 Then the author takes us through the steps of sandwiching, further quilting, and binding these pieces of wall art, followed by a wonderful section on embellishing with embroidery stitches and beading. Amy at Park City Girl is sponsoring another internet Quilt Festival for those who have Market envy. (Just kidding! If you’re making the pilgrimage to Houston you’re welcome too :). Click the logo to learn all about the Festival, And, if you have a blog, consider participating! 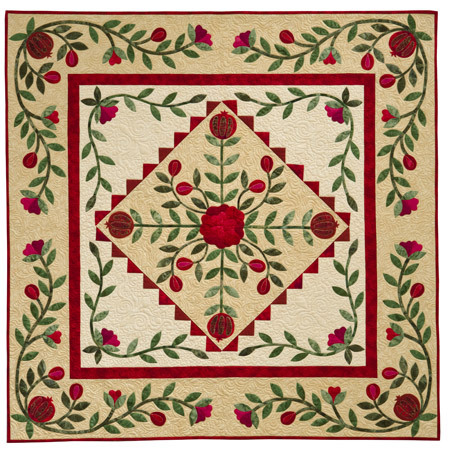 You’ll get to showcase one of your quilts for whole bunches of appreciative quilters. I’m a prize sponsor and there are lots of others too.